A month of so ago, I wrote a post about getting ready for a yard sale to help clean out my mom’s house. She’s selling the house in which my brothers and I grew up and moving to a condo. And I promised a followup. Well here it is, but like so many things in life, it’s different than what I’d expected. The yard sale was pretty good. If the goal was to get rid of unwanted things, then it was successful. It was also pretty crowded most of the time, which made the time pass quickly, and kept our emotions in check. But when it was over, I went inside the house and looked around a little. And that’s when I realized how much more there was to be cleared out. The more turned out to be the tricky stuff, mainly because most of it had belonged to my dad, who died fourteen years ago. I’ve never written a proper tribute to my father, because I can never figure out where to start. For now, I’ll just say that he was a kind, generous, and thoughtful man, and the best dad I ever could’ve wished for. One thing about him that I’ve come to appreciate over the years was his ability to listen. He was also an exquisite storyteller. Ask anyone who knew Jerry Rowen and they’ll verify that he had a story about everything. Listening and telling stories, however, don’t require equipment. But most hobbies do, and my dad was extremely committed to three main hobbies: photography, ham radio, and flying. After his family, photography was probably his favorite thing in the world. His “baby” was a Hasselblad camera that crops up in almost every memory I have of growing up. My dad was an outgoing person who smiled and laughed a lot, but he was essentially shy, so I think perhaps being the official photographer for family events gave him both something to do and kept him out of the spotlight. But even though he had a terrific camera that took great pictures, one was far from enough. He also had several 35mms, a Super 8 movie camera, and at least twenty other cameras from various periods of his life, all equipped with multiple lenses, filters, tripods, lights, and meters. Oh, and there was a darkroom in the basement, where he developed black & white film. 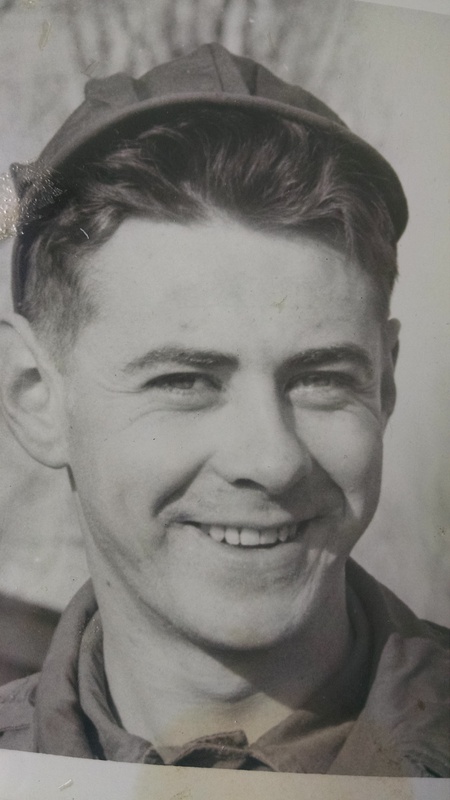 This is probably a good time to mention that my dad died quite suddenly of a brain aneurysm at age seventy-two, when he was still taking and developing pictures. Perhaps, if we’d made an effort to sell or give away all his equipment back then (2001) we would’ve found some eager takers, but now, in 2015, who still uses film? Of course, since he spent so much time taking and producing prints–and slides, and movies–there are thousands of images in various formats in the house. It’s been interesting sorting through so many–some of friends and family members I know and love; some of people I never met; some of my parents when they were young; some of my dad in his Army days. I think the Army photos are the ones that make me most emotional, perhaps because one of my nephews recently joined the Army. Or maybe it’s because my own son is due to graduate high school in a few years, and the circle of life becomes clearer to me each day. In any case, seeing my dad looking so young, handsome, and eager to find out what life had in store for him is both amusing and painful. After photography, my dad loved ham radio, as did his father before him. My mom had the good sense to sell the radio he used on a daily basis shortly after his death, but like photography, ham radio is a hobby that requires and encourages a lot of equipment, and I can’t begin to describe how many dusty, unidentifiable gadgets we’ve found, and, in most cases, tossed out. None of us know what these things are, and most of them look like they’ve seen much better days. Not to mention that time is of the essence here, as my mom was recently injured–she’s been able to provide lots of guidance, but the physical part of the move is being handled by my two brothers and me–and the closing date on the house is in September. And nobody in my family has storage space for so much stuff. Still, it’s awfully hard to throw away things that I know meant so much to my dad. 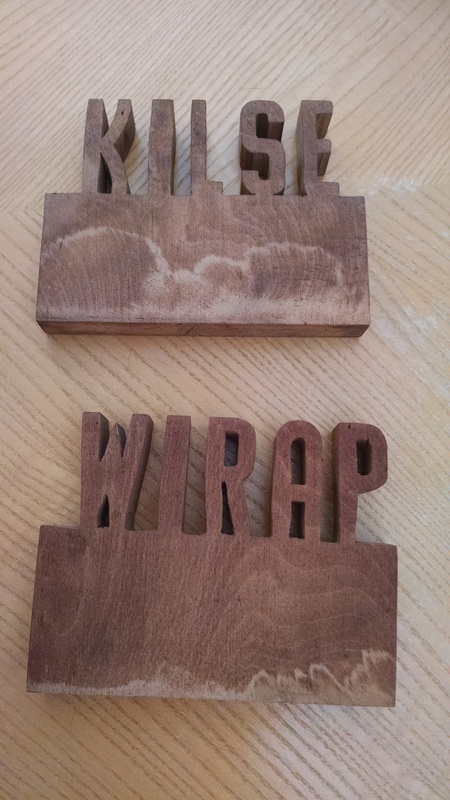 Of all the ham radio stuff, I’ve chosen to keep just a few small things, including a couple of carvings of my dad’s and grandfather’s call signs. I’m also working on a novel that features a character who’s a ham radio operator, and writing that has helped keep memories of my dad vivid in my mind. Finally, my father loved to fly. He could never afford his own airplane, but enjoyed renting Cessnas at the local airport, and taking his friends and kids up for rides. He also loved building model planes, reading about airplanes, and going to air shows to see the Thunderbirds and Blue Angels. Many of my childhood memories revolve around aircraft, but again, we simply can’t hang onto all of Dad’s airplane magazines, photos, models, and books. 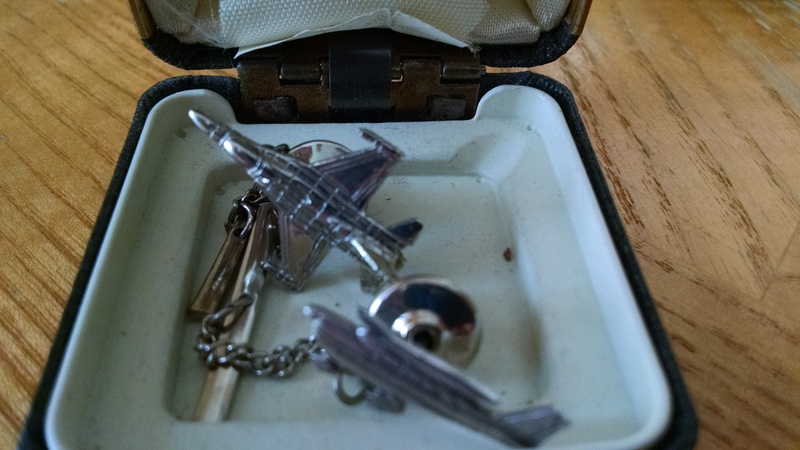 I did keep two tie clips of his, though, one of a Cessna, and one of a fighter jet. Throughout this entire cleaning out process, I’ve told myself repeatedly that everything we’re getting rid of is only material, and that memories are in our hearts. But although I know that’s true, my heart’s been a bit more sensitive in recent weeks. I’m also a little concerned about falling to pieces when it comes time to say goodbye to the house. I have such clear memories of the day we moved into it. I was almost five at the time, and recall running up and down the stairs and around on the lawn, screaming that this was our NEW HOME. The good news is that the future owners are a young family, so it’s comforting to know that they’ll build their own memories there. There’s that circle of life again. <sigh> I do hope the new family has as much fun at that address as we did. This entry was posted in aging, life, live events, moving and tagged aging, Army, blue Angels, cleaning, goodbyes, house, memories, moving, old pictures, photos, pictures, real estate, saying goodbye, Thunderbirds. Bookmark the permalink. A lovely story about a difficult time. Gosh, Jan, we’re living parallel lives these days. I’m sorry about your dad–and who knows? Maybe they met each other at some point. Or maybe they’re having a coffee somewhere now, talking about planes or cameras or something. I’d like to think so anyway. Thanks, Paula. Yes, it’s really hard to go through everything. I remember right after he died, I was looking for something my mom needed, and stumbled upon Dad’s ham radio license. I was so overwhelmed that I burst into tears and was unable to do anything but cry for a while. But as they say, time helps. The other day, I found his ham radio license again and kept it together. I did put it in my wallet though, and it’s sort of comforting to have it there. Best of luck with your project. I’m sending positive thoughts your way. Hey, how is your mom recuperating? Aw, thanks, Lauren. She’s doing pretty well, actually. Every day seems a bit better than the last. Just hoping for no major setbacks, you know? Thank you so much! I appreciate you taking the time to read and am heading over to check out your blog right now! Happy Monday! It’s so hard to see our parents age and we are powerless to stop time. How to know which pieces to hold on to and what to let go? The tears come at the most bizarre times. Beautiful picture of legacy, love and moving through difficult moments.